Facial muscles can cause deep wrinkles, frown lines, crow’s feet and more. Botox and Dysport keep the muscles relaxed which in turn smooths out your skin and helps to prevent new and deeper lines. We lose fat as we age and marionette lines (from lips to chin) and parenthesis lines (nasolabial folds) rob us of our youthful skin. Thinning lips as we age make us look less youthful. 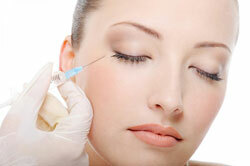 Plump up those areas with dermal fillers made from hyaluronic acid just like your skin naturally makes. Injectable skin fillers have added new dimensions to the field of cosmetic dermatology, allowing new forms of facial rejuvenation and wrinkle treatment without surgery.